Windows To Go is a cool new enterprise features to enable a mobile workforce to carry around an enterprise-managed installation of Windows on a USB thumb drive. However, only certified thumb drives appear as fixed drives and, therefore, Visual Studio 2012 can only install to certified drives. VS2012, like some other products, only supports installing to fixed drives because removable drives can be ejected and VS will not work correctly. The path entered cannot be on a removeable drive. If you’re running Windows on a fixed drive and just trying to install to a removable drive, please select another drive such as the system drive. If you do not have enough space on the system drive and do not have another fixed drive you can install to, you will need to free up the required drive space. 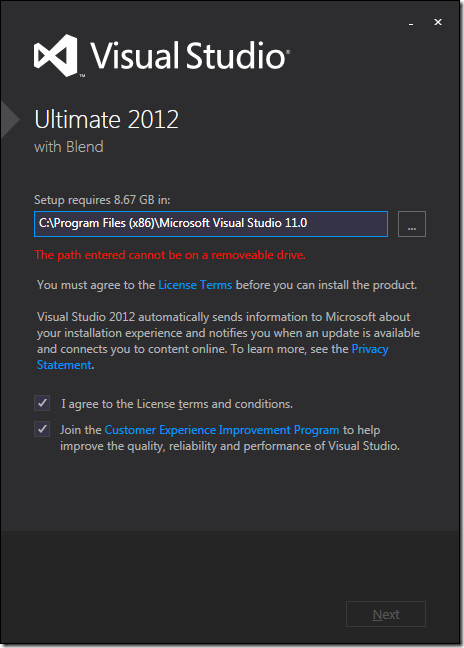 For more information, please read why VS2012 requires space on the system drive. If you are running W2G on a non-certified drive, there is no supported workaround for installing VS2012 directly onto the drive. Please purchase one of the certified thumb drives listed in the hardware consideration section of the Windows To Go feature overview.